After church today Chris and I had our hearts set on some good home cookin'. So like any normal family we went to... Luby's. :) Don't judge me and my non-cooking skills. While in line there was the cutest little boy. At one point he turned around and started staring at my giant preggo belly. He then looks at me and points at it and says really loud: "What happened?" (In a really curious and slightly disgusted voice). I told him there was a baby in there and his curiosity was totally satisfied, but I nearly wet my pants from laughing so hard. One of my favorite nicknames for Chris is: Human Garbage Disposal. 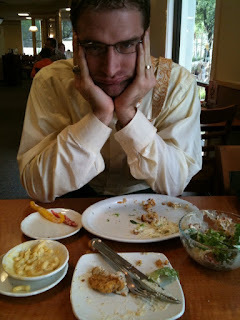 Here is the proof: In less than 30 minutes he consumed a side salad (well only half), a roll, mac-n-cheese, fish and tartar sauce, chicken fried steak with gravy (yes he had two entrees because to add a second is only $2 extra dollar), oh and then some broccoli to stay healthy. His pregnant wife that has a very good appetite now took home an entire box of leftovers. So how is that for a totally random post? Hi and thanks for stopping by! I'm Becky Kiser. I'm a wife, mom to 3 girls, writer, speaker, and founder of Sacred Holidays. I love Jesus and desire to see women follow Him more fully as we go hard after Him and what He has called us to. You are on your way to know how to get started (or start better). Simply confirm your subscription to the email list and we’ll send you the PDF! get all blog Posts and updates from Becky DIRECTLY in your inbox!